Always wanted to drive back to the place where I’ve grown up (a part of it). So decided to ditch the bus this time. Invited my good friend kalyan. It was a good drive. On the way back Kalyan had to go somewhere. Was not sure of driving alone for hours. But after the first 20 mins, I enjoyed every KM . It was just me, the car and the road. Thanks to GNOME foundation for sponsoring my travel and accomodation. And to Novell for the rest. Had a productive GUADEC. End of a wonderful July! Best is yet to come – Semper Exploro!! 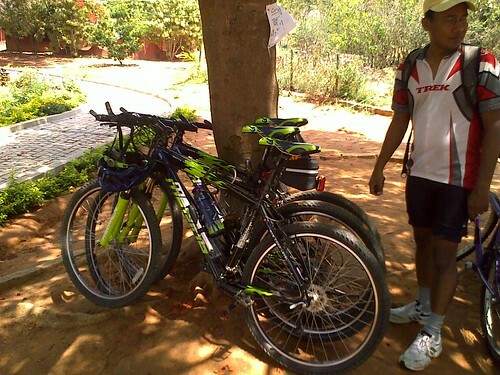 When I saw a mail in BBC from Cycling And More (CAM) about a ride to Chikmagalur, thanks to the caffiene in me – was so excited and started to pull in people. Punya and Me signedup immediately and was waiting for the day. Action started a little early. Friday evening, I was getting late at work and had to deliver a package to my brother. Already late, I decided to use the Bike (fastest during peak traffic) and went around. Asked my bro to wait for me on the main road. A brief drop (felt like a environment friendly drug dealer on a bike :)) and I was on the way to the meeting point and made it on time. Meet other riders, loaded the bike and found my seat. The real test started. There was a steady climb for several KMs . The group thinned out . Finally Me and Arvind R teamed up. Few kilometers before Chikmagalur saw Manjula and Arvind N tailing us. 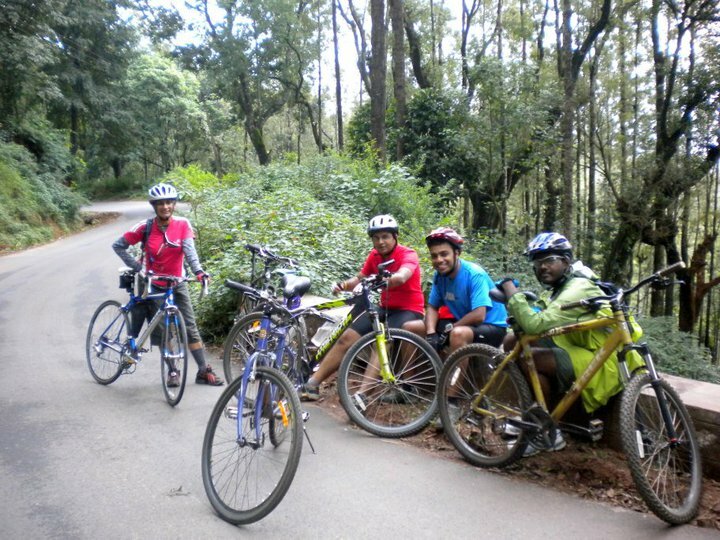 All four of reached Chikmagalur on schedule. I should say that riding in a small group is more fun than chugging alone. During lunch, ‘Iron man’ Mohan and Ram joined us. 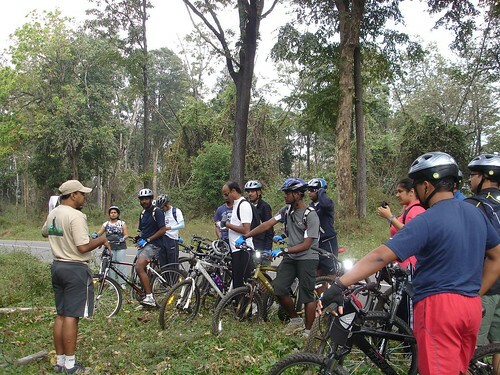 Other riders were reaching Chikmagalur . 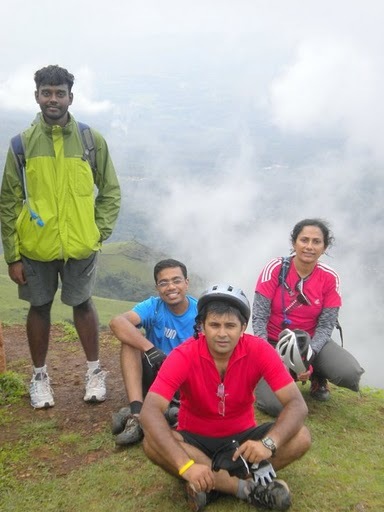 We were all pumped up looking at the hill that we would be climbing – Mullayanagiri. It was about 20 kms of pure climb. Took some pit stops during the climb. But the last 2 KM killed my spirit. Nothing left in my body, I was worn out. Stopped for a while. Recovered a bit and reached the top. 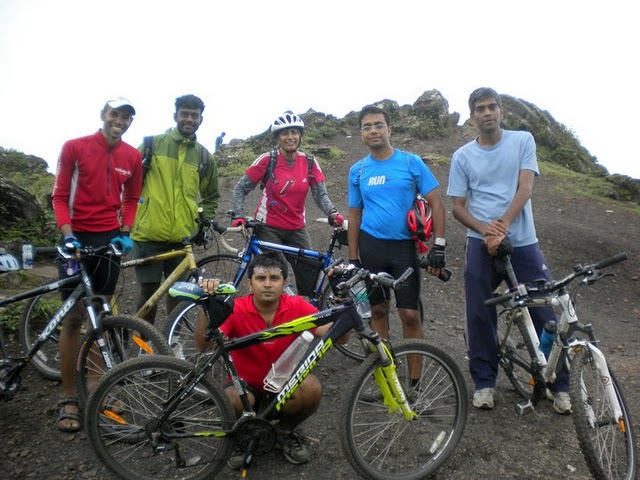 By then Mohan, Manjula, Arvind R, Arvind N were at the peak already. Downhill ride was fun! 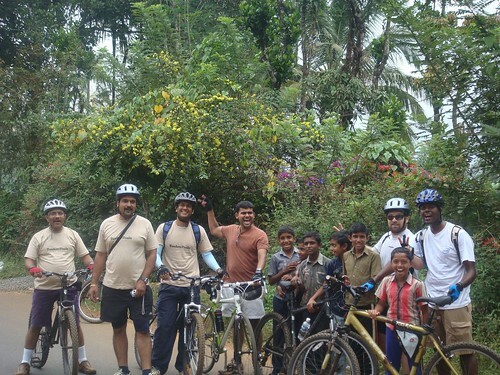 Did a leasurly ride to Belur. Rode with Punya through the lake and sunflower fields. Belur temple is Wow! Spent a little time there . 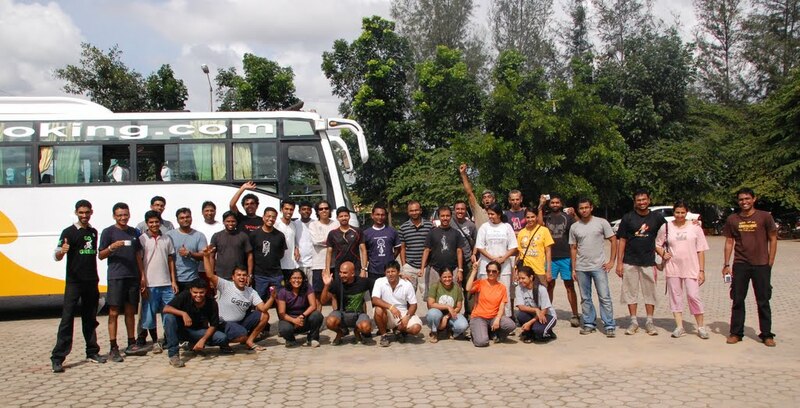 Many started the second leg of the day – to Hassan. We (not Punya) decided to skip. Hopped on the bus. Sleepy … Woke up in Bangalore. Day 1 : I was there for one reason. To test my legs. I was bit unsure in the beginning and was hopeful that if something happens I would be able to hop into the support car (Why?). I was hoping that I would be able to ride at least the first half. Rashmin passed me and he said “come on …. !” and I was mumbling “I’m on.. 1.. 1/4 .. legs and ..blah “. I have no clue what happened next. Felt like my engines finally started and I increased my pace. Joined the pack lead Samsheer. Then a downhill and I couldn’t resist it. Slipped into a higher gear and started to speed away. Few moments later a character showed up in my peripheral vision. Tommy joined me and we sped away. We rode hard. Tommy is a awesome climber. I compensated the lack of strong right leg (reason) with higher cadence during climbs. And I usually caught up with him on the downhills. I was crazy for downhills. At one descent I actually felt my bike flying over potholes. Rashmin later said that we were going 50km+ (probably more) on some downhills. Day 2: A leisure ride. Enjoyed talking with the group. I guess Tommy had trouble riding slow 😉 . At times I acted as a the wise-one and gave ‘tips’ to Venky. He was politely listening :). The climax was simply brilliant. It got over with a very very steep climb. My heart was thumping very very hard (unhealthy rate). It was simply brilliant. Around 12 bikers started by 6:00 (i guess) at Sarjapur ORR junction. Series of climbs. Fun. I was impressed by my pace it was bit more than my morning rides. So riding in groups make a lot of difference. 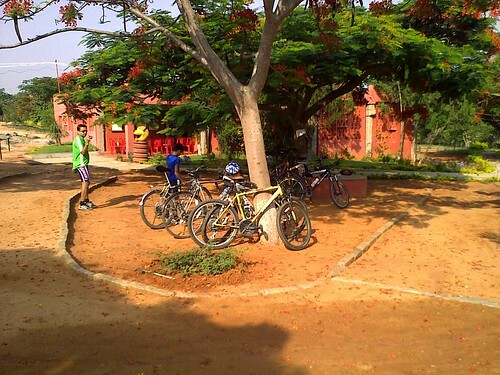 Reached Jain Farms after 80 minutes.I didnt’t know that we would be crossing into TamilNadu ! Head winds added a extra 30 minutes on the return ride. 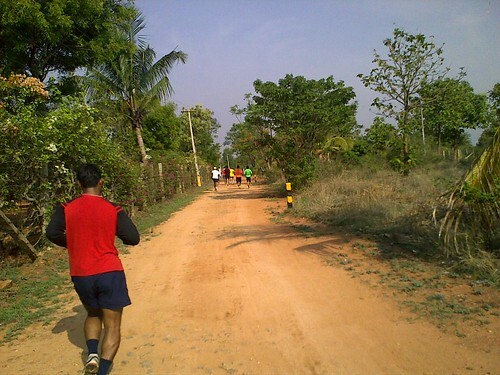 At some part of Sarjapur road I lost sight of the lead pack. I knew that one rider was behind me. I was so tired I thought I was on a highway to Delhi till I saw some familiar apartments on the horizon . People were talking about TFN. Me ? I dont know yet ! This weekend wanted to go for a ride. STR (Staurday Trail Ride) was interesting. Saw some pictures from their previous rides and was wondering whether I would be able to actually match up with their pace. Anyhoo we (me & Kalyan) started @ 0545 and reached the rendezvous point @ 0600. Met the other riders and off we went. Well, i saw the black tar road only for few minutes. The lead pack jumped off the road and it was dirt road (most of the time). And my bike is dirty ! Finally .. felt like i did some justice to trek over this ride .. Hoping to do more. – Carry more water and some chocolates. Thanks to Kalyan & Nikanth for letting me park it in their house. I’m not confident of parking in office (yet) . Bought a Trek 3700 today. A beautiful machine in ‘Acid Gold’ colour. Will be using this for cross training and some fun rides on weekends. Have to assess about commuting to office. (Distance is not a problem . Parking is ). Initially I was looking at a Firefox Target. But when i tried out the Trek i just had to get it. Its definitely worth it. Rohan from BOTS suggested that I go for a 4300. But itz a bit over my budget. so settled for a 3700. This Trek 3700 is from BumsOnTheSaddle.com . They are building a nice community. Thanks a lot Rohan, Nikhil and umm ForgotHisName! It was a good experience. A nice run through the bike and personalizing it for me! 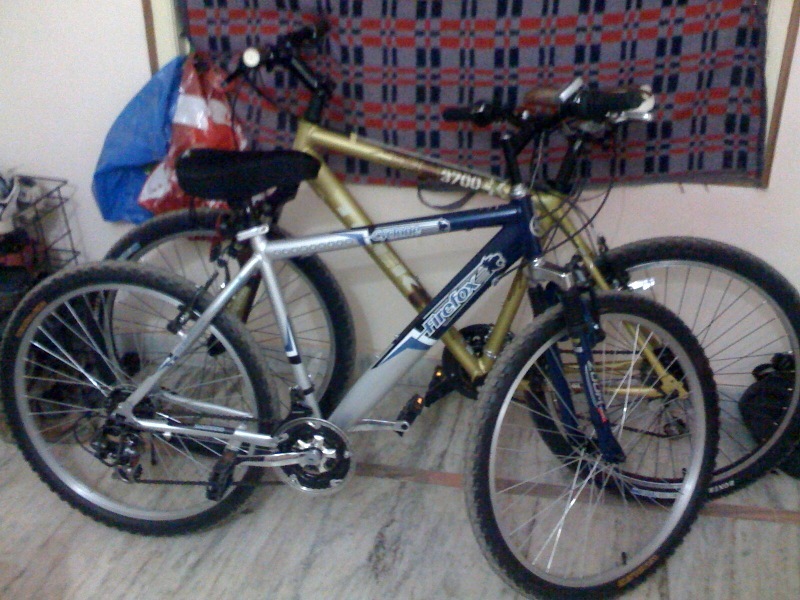 I rode all the way from Jayanagar (BOTS) to Koramangala 1st block (6km ?). Was worried about the traffic a bit .. But it was not a problem at all. The ride was smooth. Was learning about the gears and really understood why people stress on consistent cadence ! 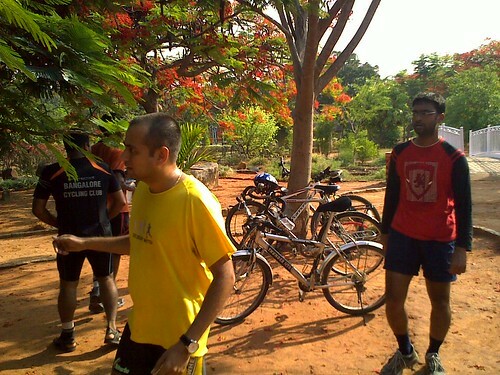 After that had a quick lunch and started off to CV Raman Nagar (10 km) . It was around 1430 and the sun just drained me out when I went over Domlur flyover. Reached Kalyan’s place. Went out with Kalyan and he bought a Firefox Cyclone. I should have got a bottle cage along with the bike. Stopping and drinking from the bottle in the backpack wasted time. I’m going to enjoy this part of my life. Yay! New would be bikers : Please do your own research before getting a bike. It helps you a lot in understanding your equipment. Hmm … big post. Been a while ..